Put it together and you get bird-dogging, the act of closely scrutinizing a politician’s views — which is what a group of five students decided to do when Braddock Mayor John Fetterman visited the Pitt Democrats as part of his campaign for Pennsylvania Lieutenant Governor. This handful of students, unaffiliated with any political group on campus, gathered an hour before Fetterman was set to begin speaking to discuss how they would question the mayor when he arrived on campus. Sophomores Sean Bailey and Dighan Kelly explained the basics of bird-dogging to the small group. Bailey, a computer science and philosophy major who currently serves as the co-chair of the University chapter of the Young Democratic Socialists, handed everyone a single piece of printer paper. 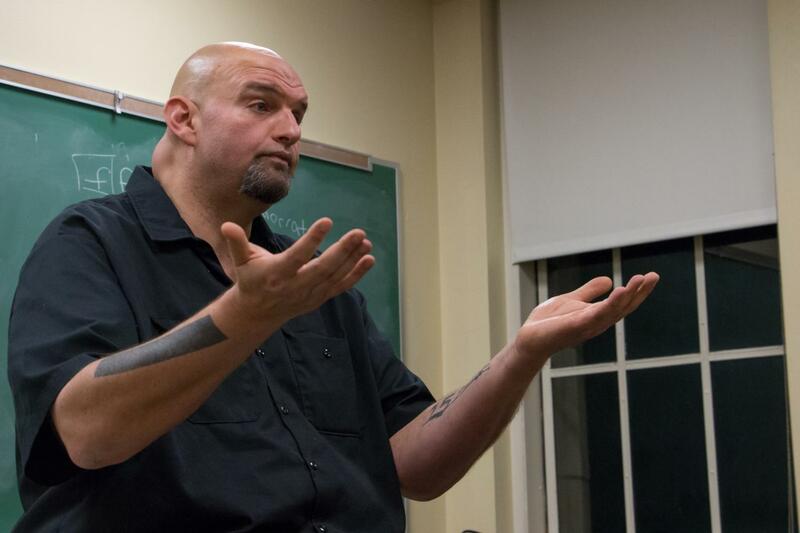 On it were the issues they perceived Fetterman to be weak on — including abortion, fracking and non-profit laws that govern entities such as UPMC and the University of Pittsburgh. The group moved into room 239 of the Cathedral and waited for Fetterman to arrive. He entered into the room of about 50 students and slowly pulled off his black Carhartt jacket, exposing the tattoos on both his forearms. The zip code “15104” of Braddock is written across his left arm, the now-seven marks on his right arm signify the number of lives lost in Braddock during his time as mayor and a black block covers the rest of his right arm. He briefly told his story and discussed his nontraditional entry into politics to the group of students listening. He spoke of how the sudden death of a close friend inspired him to get involved in mentoring, which in turn inspired him to run for mayor — and how he thinks he can affect institutional change from within government. As soon as he opened the floor to questions, Kelly’s hand shot up. Fetterman took a sharp inhale and grinned a little. Fetterman’s response for why he supports Costa introduced one of his major themes of the night — compromise. He said he supports Costa because he’d never consider supporting people like Costa’s Republican opponent, Sen. Pat Toomey. When asked about the environment and why he supported allowing U.S. Steel fracking at Edgar Thomson Works mill in Braddock, his answer was jobs-centered. Throughout the night he continued to insist this compromise must be made. He also fielded the bird-doggers’ questions without hesitation because he thinks they should be asked.